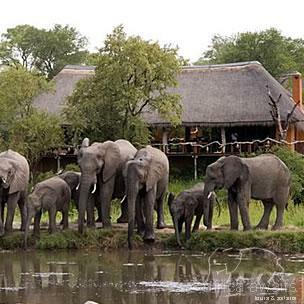 Simbambili Game Lodge is a highly individual destination for the discerning traveller. 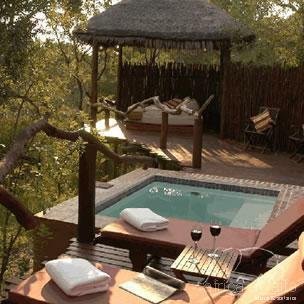 Set in magnificent trees along the meandering Manyeleti River with views over extensive savannah grassland that teems with wildlife in the Sabi Sand Game Reserve, part of the world renowned as greater Kruger National Park. Nestled inconspicuously among dense stands of Knobthorn and Jackalberry trees lie individually hand crafted suites sensitively designed to blend with the environment and carefully positioned to enhance privacy. Sophisticated yet simple, each suite has spectacular views whether from the unique en-suite bathrooms and salas or individual private plunge pools. Tireless attention to detail and the desires of our guests is made possible by limiting this exclusive experience to a maximum of twelve. Our guests are encouraged to enjoy the extraordinary and unique wildlife of Africa, whether it is your choice to linger at a close encounter with lion, leopard, elephant, rhino and buffalo or to be amazed by the extensive array of birds and insects. Your ranger and tracker team will astound you with their ability to track big game, whether on foot or on an open vehicle safari. Fascinating insights will be conveyed into this extraordinary environment. All this is complemented by elegant cuisine, a selection fine wines from our cellar and by the warmth of true African hospitality. Simbambili is an intimate and personal experience of Africa at its best. 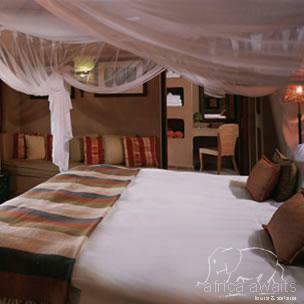 With your holiday, safari or business trip from in to Simbambili Game Lodge in Kruger National Park.